Samsung SDI launched its new ESS products that adopted innovative design technology. The company presented new lineup of its comprehensive ESS solutions at the Energy Storage Europe 2017, an international exhibition held for three days from March 14, 2017 in Dusseldorf, Germany. Being an exhibition dedicated to ESS batteries and renewable energies, the Energy Storage Europe 2017 was taken part by more than 100 companies in ESS-related front and rear industries from around 50 countries, including major ESS companies such as ABB, Siemens and Younicos that have operations in Europe and Global Market. The company showcased new ESS products at the exhibition, high-capacity E2 and high-power P3 models, whose energy density is sharply increased. E2 model is a high-capacity ESS battery that substantially increased the number of cells integrated in the container by adopting innovative design technology. Samsung SDI dramatically raised intensity of space in the ESS container by upgrading module design and rack arrangement technology. The company designed a compact module by reducing its size from 42 liter to 35 liter, while configuring it to increase the number of integrated cells in the module by 10% from 20 in previous modules to 22 cells. Its design is innovated to integrate larger number of cells in a smaller space. And the container is designed to enclose larger number of ESS modules by adopting a new rack arrangement method that removed passages in the ESS container. The company prevented any problem in managing ESS by adopting improved cooling technology and installing gates on both sides of the container while removing passages. As a result, E2 model realized the high-capacity ESS battery by enclosing the capacity of 9.1MWh in the container, nearly twice larger than previous products. E2 model is developed targeting utility ESS market that requires large capacity. Needed for storing energy during low-demand hours and using it in high-demand hours, utility ESS batteries are widely used in recent years in connection with renewable energies such as solar photovoltaic power and wind power. As a utility ESS with larger capacity can store more energy, it can supply energy to larger number of facilities. Samsung SDI also unveiled P3, a further upgraded high-power model. P3 is designed to maintain high-power for longer time by using 78Ah high-power and high energy density cells with 15% increased capacity without changing the size of 68Ah battery cells adopted for previous models. P3 model can be used for power stabilization that requires high-power ESS. An ESS for power stabilization plays the role of stabilizing quality of power at the substation by maintaining power of the generator at a certain value. ESS allows supplying high quality power by storing power when it exceeds standard value and discharging power when it is in shortage. And when power is insufficient, it needs high-power ESS that can supplement strong energy in an instant. The common feature of E2 and P3 is that their energy density is improved by increasing capacity while retaining the size of previous ESS containers. ESSs with increased energy density can save construction and facility management costs by reducing scale of ESS facilities. Eventually, this will lead to reduction in investment on the part of customers. In addition, Samsung SDI displayed two new residential ESS modules. One of them is an advanced lithium-ion ESS battery that can replace previous lead-acid battery by adopting a technology of delivering 48V, the same voltage as the lead-acid battery. The other is an ESS product that can reduce cost of ESS system by providing high voltage. “The new lineup further sharpens competitive edge of our ESS products. We will lead the world market by developing advanced ESS technologies ahead of others,” said Sewoong Park, vice president for ESS Team, Samsung SDI. Navigant Research expects that the world ESS market will grow by around 50% to 4.3GWh in this year, and sharply increase by around 60% annually by 2020 to 14.8GWh. 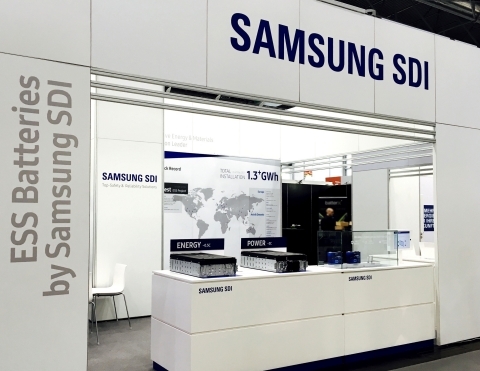 In its report on the world ESS market for 2015, B3, a market research institution, announced that Samsung SDI ranked first in the market by taking 18% of its share.